A hooded silhouette was outlined on an overhanging rock in the blue lunar light of Tinmal and Hamal. Motionless, the individual was tracking his every movement. Pelmen shivered. He looks more like a protodactyl ready to fall on its prey than anything else. Not wishing to find himself alone in the presence of the unnerving stranger for a moment longer than necessary, with no further thought to what Komel was doing, he hurried back to the relative safety of the hut. Pelmen hates being a tanner, but that’s all he would ever be, thanks to the rigid caste system amongst his people, the hevelens. Then he meets Master Galn Boisencroix and his family. The master carpenter opens up a world of archery to young Pelmen, who excels at his newfound skill. But Pelmen’s intractable father would have none of it, and tries to force Pelmen to stay in the tannery. This ebook includes the trilogy three books, The Breath of Aoles, Turquoise Water and The Flames of the Immolated, along with A brief History of Ardalia, which will help you go deeper into the universe imagined by the author, a map of Ardalia, and a glossary. You will also find pronunciation suggestions for the peculiar words of Ardalia and the characters’ names. 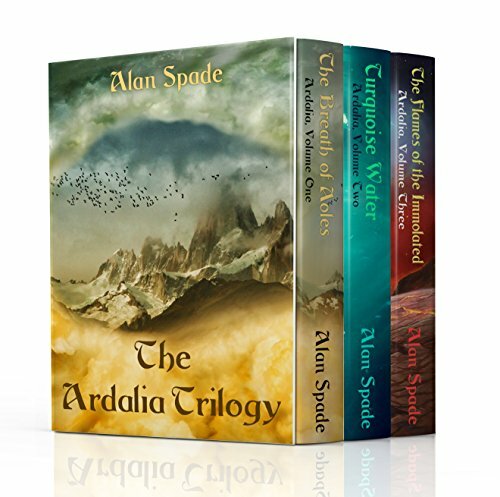 Click here or type in http://geni.us/ardalia into your web browser to pick up your copy of The Ardalia Trilogy in the Amazon Kindle store. Alan Spade worked for eight years for the press, reviewing video games. In his youth, he acquainted himself with the classic French authors, while immersing himself in the works of H. P. Lovecraft, Isaac Asimov, J. R. R. Tolkien and Stephen King. That wide range of influences is reflected in his style, simultaneously approachable, visually evocative and imaginative. You can visit Alan’s Amazon author page if you click here or type in http://geni.us/alan into your web browser.